Durable, easy to install. 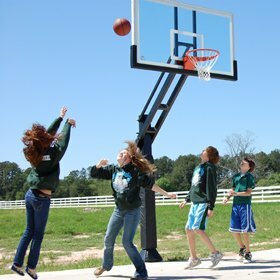 A decent in-ground hoop system at a reasonable price. This is the “Silver” model of the Pro Dunk series. There are four models, Diamond – Platinum – Gold – Silver. The silver system is the cheapest and least impressive of the models. Still a great hoop for this price. 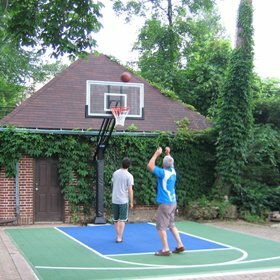 Pro Dunk Basketball hoop systems have been around for a while and appear to be a consumer favorite. If you go to their website, they have well over 1000 reviewed basketball hoops. Not knowing much about the pro dunk hoops, I contacted their team to learn more. My first impression is that they have a friendly crew. I learned that they pride themselves on their reviews. It would be nice to have some more reviews start showing up on Amazon, but for now, there are a lot of reviews to comb through on their website. Upon further inspection, it looks like they control almost all of their own reviews. So, all of their reviews on their website could easily be falsified, as they can’t be verified using a third party reviewing system, such as ShopperApproved, TrustPilot, or Revoo. And being the fact that there is no other retailer of Pro Dunk Hoops, other than the manufacturer, you can see how many of their reviews could be falsified. I also learned that they have four hoops that they sell through Amazon. I was provided a link for all of them. And we’ve also seen concerning reviews about rusting, like these. If you go to their website and look at their goals, it seems that as you go up in price and features, the average reviews get incrementally better. Seems a bit convenient. Now, we all know that, when left to the free market, we would be extremely lucky to have that type of outcome. What is more likely is that they made false reviews to bump up their “average review” for that specific model. It would also appear the company has made up locations on Google Maps to try and show up for local searches. The Look. Sitting in your driveway, the silver Pro Dunk Hoop looks good. Wide Backboard Very thick and sturdy to provide great stability for the hoop. Crank System The Hoop lowers to 5 feet for small children. This is lower than most other basketball hoop systems. We didn’t love the crank handle though. Didn’t hate it, just didn’t love it. Prefer the patented lower/raising system of the Mammoth hoops. The lowering of below 5 feet is a double edged sword, fun for kids, but also dangerous, as it is not approved by the ASTM and can be dangerous for young players. If you are looking for a professional grade system, you should go with the something more reputable, like a Goalrilla. Company’s review tactics seem to be sketchy. 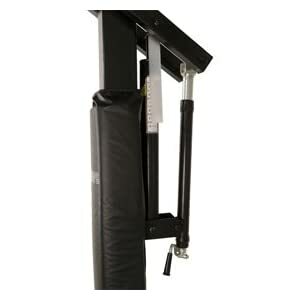 Goal’s overhang is one of the longest in the business, creating quite a possible issue if it will be hanging over a driveway. You may have to constantly be getting out of your car to crank it up so you don’t back into it. Paint seems to flake and chip easily, many reviews speaking to the rusting nature of the goal, even on brand new, delivered product. The company claims to be a BBB accredited company on their website, but upon further investigation at BBB.org, we found this was not true. The only other online reviews that I could find were from the corporate website. It would be nice if there were more reviews on independent websites like Amazon. I would say that the Diamond Version is a decent hoop system. You do have to crank that thing a lot to lower and raise it. Your arm may be too tired to actually play. My one caution is that the reviews online are coming from the Pro Dunk’s website itself and the reviews from Amazon are mediocre, at best. Given the choice, I would avoid a Pro Dunk and go with something from a more reputable company, such as Goalrilla.